In an effort to cut through the rhetoric around retirement security, Congressman Mike Michaud joined retirement security advocates and residents from the Lewiston-Auburn area to hear about the importance of programs like Social Security and Medicare in the lives of constituents. For Dan and Jo-An Gregorie, retirees who live in Lewiston, Social Security is the lifeline that allows them to live independently despite years of mounting medical debt due to chronic health problems. "To this day, we spend a good deal of time sorting through and figuring which bills to pay. Even though we currently owe more than twice what we paid for our home, we consider ourselves very fortunate that we still own one compared to so many who don't," said Dan Gregorie, who was diagnosed with a rare genetic disorder that causes a variety of health problems. "Social Security affords us what little we have. I am very glad that Congressman Michaud is here today to listen to our stories. I believe more lawmakers need to understand that our retirement security system helps so many people." Participants also called for congressional action to strengthen the country's retirement security system and urged Congressman Michaud to support policies that ensure Mainers can retire and age in dignity including establishing a Social Security caregiver credit for individuals who leave the workforce to care for a loved one for an extended period of time, as well as increasing the cap on Social Security taxes so the wealthiest Americans pay their fair share into a system that works for everyone. "If there is one thing our country’s retirement system was not prepared for, it's the extreme income inequality that exists in our economy today,” said Jim Wellehan, owner of Lamey-Wellehan Shoes. "Social Security is not in crisis, but it does face a long-term deficit. If we want Social Security to be put on sound economic footing, we need to scrap this cap and make sure everyone pays their fair share into a program where everyone benefits." Currently, no Social Security payroll tax is paid on earnings above $117,000. An individual’s effective tax rate for Social Security payroll taxes decreases for every dollar they make above the $117,000 cap – effectively creating a tax loophole for millionaires. Senator Tom Harkin (D-Iowa) has proposed the "Strengthen Social Security Act" which would increase the cap on Social Security taxes as well as calculate cost of living adjustments using a Consumer Price Index for Elderly Consumers (CPI-E), which is considered a more fair and accurate assessment of cost of living increases for seniors. In addition to changes to the Social Security program, advocates called for an expansion of the Social Security caregiver credit for individuals who leave the workforce to care for a loved one for an extended period of time. "I care for my mother in-person nearly every day of the year. I provide meals, make appointments, do groceries, pharmacy, laundry, cleaning and help to meet all other basic needs for her," said Susann Pelletier, who lives in Lewiston and takes care of her 92-year-old mother. "Because I chose to stay at home with my child in formative years and now am providing care for my mother, my professional career has mostly been comprised of part-time positions. I have paid so little over the years into the Social Security system that my monthly social security check when I reach retirement will put my income below the poverty line, if I were on my own." A 2013 report released by Social Security Works found that in Maine almost a quarter of the population receives benefits from Social Security, benefits that account for 7.6% of the state's total personal income. The program also has a sizable impact on keeping Maine seniors out of poverty. 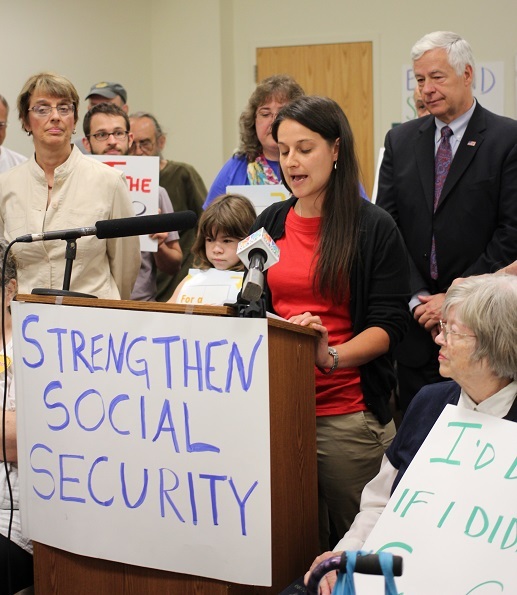 From 2009-2011 it was estimated that almost 40% of Mainers over 65 were kept out of poverty because of Social Security. The Social Security program not only provides monthly benefits to retirees, it helps keep thousands of Maine children from falling into poverty. In 2010, more than 13,000 children in the 2nd Congressional District were beneficiaries of Social Security, more than 24,000 children statewide. "Through their hard work and payroll tax contributions, Maine families earn Social Security's retirement, disability and survivorship protections,” said MaryLou Beaver, Maine Director of Every Child Matters, a children's advocacy group. "They know that if something were to happen to them, their children would have a safety net." "If today has shown us anything, it's that our retirement system has touched the lives of thousands of Mainers in so many ways," said MPA Androscoggin Valley Organizer Gen Lysen. "There are a number of proposals in Congress today that would do much to bolster and make our retirement system more accessible and fair. We can move beyond protecting Social Security - beating back cuts to benefits, eligibility changes and privatization - to strengthening the system, now and for generations to come."